The company was honored with the Innovators Award – Bronze Level from Vision Systems Design (VSD) at a special ceremony on April 10, 2018, in Boston, Mass. 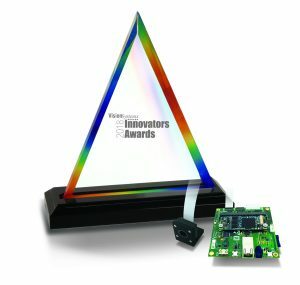 Critical Link, LLC, experts in image sensor technology, system-on-chip (SoC) and field-programmable gate array (FPGA) designs, vision protocols, and signal processing, received the prestigious Innovators Award – Bronze level at the Fourth Annual Vision Systems Design Innovators Awards presentation, held during The Vision Show in Boston, Mass. The MitySOM®-5CSX Embedded Vision Development Kit (VDK) for Basler dart BCON Cameras was selected for the award in the Embedded Vision category by a panel of esteemed experts from system integrator and end-user companies. Critical Link’s Embedded Vision Development Kit provides a complete hardware and software solution for system developers, streamlining embedded imaging application developments. To learn more about Critical Link’s embedded systems, custom imaging platforms, and full engineering support services and product development, visit http://www.criticallink.com/services/. All 2018 Vision Systems Design Innovators Awards Honorees will be featured in the June issue of Vision Systems Design magazine as well as on http://www.vision-systems.com. About The Vision Systems Design 2018 Innovators Award Program: The Vision Systems Design 2018 Innovators Award program reviewed and recognized the most innovative products and services in the vision and image processing industry. Honorees were announced at AIA Vision 2018 held in Boston, MA, USA. Criteria used in the Innovators Awards ranking included: originality, innovation; impact on designers, systems integrators and end-users; fulfilling a need in the market that hasn’t been addressed, leveraging a novel technology, and increasing productivity.Back in the day, a growing shortage of engineering resources threatened to hold back innovation and development initiatives in the realm of embedded hardware and software.